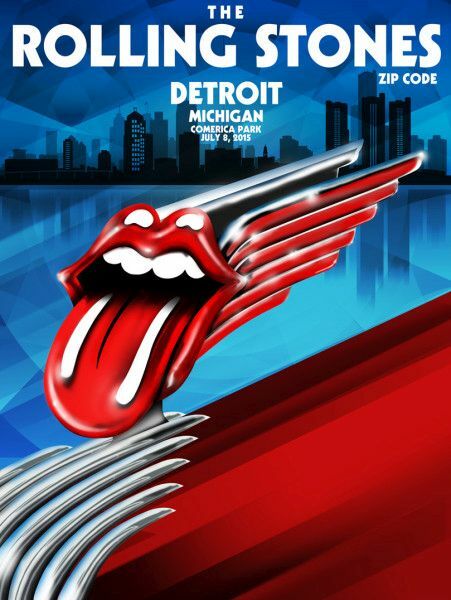 This thread is for live updates and comments regarding The Rolling Stones Detroit MI USA 8-July-2015 show. Please tell us your pre- and post-show thoughts and comments here. Detroit is on Eastern Standard Time in America. Add 6 hours for Central European time, add 5 hours for UK time and so on. Here's hoping that everyone in attendance has a great time! And for those of us who attempt to follow along at home, let's hope Detroit's cell phone service has plenty of bandwith for our periscopers! If I'm not mistaken, I think some of "IORR's Finest" will be in attendance tonight and, technology willing, those of us at home could have a better experience than last week! Thanks in advance to all attendees who share their experiences with those of us at home! To all who will be in attendance, Have a Blast and Rock On! detroit are you ready to Rock and ROLLLLLLLL? Once again, I love the poster (and shirt). really well done. Detroit, MN. Indy, FLA. Nice stuff (other than the sports-themed stuff, which I hate, but I understand, some people like scotch, some bourbon, and every dollar counts). Agreed with most... I like that Detroit shirt/poster for what I think are the automobile references but it also looks a bit like the Detroit Red Wings logo which, as a Bruins fan, I can do without ! One question though: Can someone local or with knowledge of Detroit explain the "tiger skin" pattern being used on the rally towels? I know the Detroit baseball team is the Tigers but have never really seen the team use much along the way of the actual tiger skin design in their team "stuff". To me that tiger print on the towel seems to look much more like a reference to the Cincinnati Bengals football team. Yeah I've never seen the tiger skin pattern much exploited by the Detroit Tigers but have seen full on tiger heads used in their merch. I'm surprised they didn't just use a tiger head with a Stones tongue but maybe they are a bit conservative now in light of probably having to pay out after the recent copyright infringement claims. Yeah I've never seen the tiger skin pattern much exploited by the Detroit Tigers but have seen full on tiger heads used in their merch. Thanks for doing the addition research Naturalust and Irix! Hopefully the "Detroit locals" are seeing the tiger print as a local reference more so than some of us sitting at home (at least I know that NL & I aren't local to Detroit, maybe Irix is, I'm not sure). Apologies for the side trip into "local merchandise discussionville". Back to looking forward to the show! Thanks for doing the addition research Naturalust and Irix! My pleasure! I have the FOCS-Ticket too for each Show on this Tour - Front of Computer Screen .... at the moment I'm 4230 miles away from Detroit. From [en.wikipedia.org] : "The Detroit Tigers are a Major League Baseball team based in Detroit, Michigan. The team currently plays its home games at Comerica Park in Downtown Detroit." Edited 1 time(s). Last edit at 2015-07-08 23:10 by Irix. LOVE IT!!! "FOCS-Tickets" That's great! I suddenly feel so close... I'm only 514 miles away now but by showtime I'll be home and 540 miles away. Planning on enjoying my FOCS seat with some good whiskey! And I'll still be envious of all who are actually in the stadium! Hope EVERYONE has a great time tonight! Unfortunately haven't got one tonight , but will look on IORR tomorrow morning sometime here in Spain. Been 41C and very sunny and hot here today,so pretty tired now with the heat and stuff to do etc. Will be in bed within an hour. Soundcheck - Just My Imagination ! Kurt is Periscoping. Just My Imagination sounds great! Do you have a link or Kurt's twitter handle, please? I'd love to listen in . I hope to scope most of the show from section 114 down low. Have portable battery. My first scope. Hoping for the best. Thanks for the infos, Drake. It seems the people in Detroit will have a great concert tonight. Thank you kindly for the link Drake! Edited 1 time(s). Last edit at 2015-07-09 01:08 by Plink.